Yesterday, when changes to Google Reader were rolled out to all users, there was a lot of talk about the Gmail revamp too and today the long awaited revamp of Google’s popular email service is available to everyone, simply click “switch to the new look”, which should be in the bottom right hand corner of the main screen. 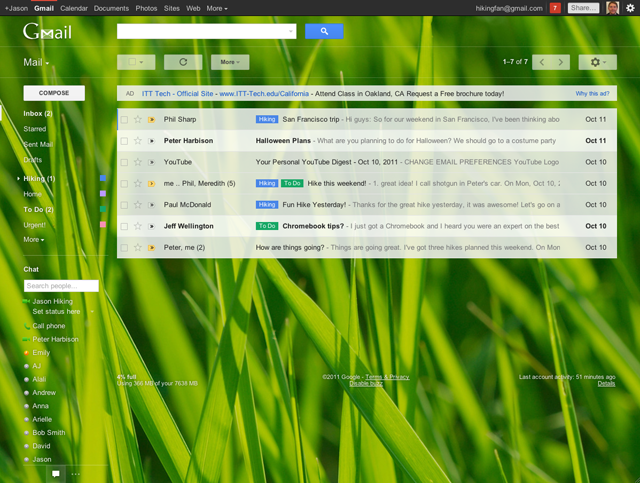 There have been rumours of a Gmail makeover for months now and Google gave everyone a sneak peek at the new design back in the summer, but it’s finally here and you know what, we like what we see so far. We know everyone’s meant to hate change and join together to protest, but most of the tweaks seem to make sense after a quick play around with the new version. When it comes to design, the new look has got that cleaner, sparser look we’ve become accustomed to with Google’s other properties and it’s also been specially designed to fully adapt to any screen you’re using, so you always have the best possible user experience. If you’re a fan of the chat functionality you can now change the size of boxes, but if you rarely use the service then you can just hide it too. There are also ten new HD themes to play around with and some of our old favourites have had a fresh lick of paint. Finally, we love the fact that there’s a better search tool too, making it much easier to sift through emails and find exactly what it is you’re looking for. If you’re one of those moany people who just doesn’t like change then you can stick with the old look. For now that is.